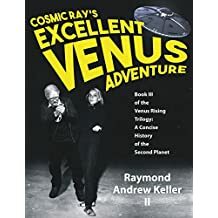 Dr. Raymond A. Keller, II, a retired history professor currently serving at In Touch and Concerned, a United Way agency providing accessible and affordable transportation options for persons with disabilities, seniors and veterans in Monongalia County, West Virginia, has recently come out with his second and third books in the Venus Rising trilogy. 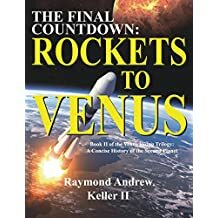 The two new books are Final Countdown: Rockets to Venus! and The Cosmic Ray’s Excellent Venus Adventure. Dr. Keller’s books explore various facets of conditions and life on Venus in many dimensions from a perspective of conspiracies, history, theosophy, ufology and current events, especially space research. 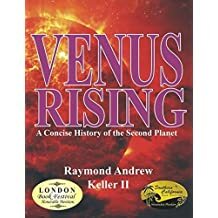 To date, the first book, Venus Rising: A Concise History of the Second Planet, has won wild card awards at both the Southern California and London, United Kingdom, book festivals. Paranormal investigator and reporter Ariel Crawford wrote the introductions to Final Countdown: Rockets to Venus! ; and Michael La Riche of the Coast-to-Coast A.M. Radio Discussion groups in Northeast Ohio wrote the foreword for Dr. Keller’s book. Dr. Keller has lived and worked in 44 different countries and has been writing about UFOs and paranormal activity since 1967. He was the founder and director of the Outer Space International Research and Investigations Society (OSIRIS) of Hilmar, California, as well as the publisher and co-editor of the New Millennial Star, a monthly pre-Internet tabloid newspaper with a circulation of 7,500 copies. He received his doctoral degree from West Virginia University in 2011, focusing on various aspects of the Basque settlement of Venezuela; and his master’s degree from the same institution in 2004, majoring in foreign language with an emphasis on magic realism in Latin American literature. Married to Ydalis M. Herrera of Venezuela, they reside in Morgantown, West Virginia. Dr. Raymond A. Keller, II, a retired history professor, has lived and worked in 44 different countries and has been writing about UFOs and paranormal activity since 1967. He received his doctoral degree from West Virginia University in 2011, focusing on various aspects of the Basque settlement of Venezuela; and his master’s degree from the same institution in 2004, majoring in foreign language with an emphasis on magic realism in Latin American literature. A Canadian defense minister who “spilled the beans” about Venusians and other aliens living and working among us, scientists from around the world engineering new developments to explore and understand various outer space phenomena like magnetic reconnection, traveling faster than the speed of light, and the requisites for intelligent life on other planets, “Cosmic Ray” traversing Dimension X with the Queen of Outer Space, Dolores Barrios. This book also contains three never-before-seen photos of the Queen, to include some with the Cosmic Ray himself. A couple from Northern California who as the co-presidents of one of America’s first flying saucer clubs travel along with their group’s membership to every UFO meeting and sky watch in 1950’s California with the hopes of reconnecting with Venusians they once encountered in the Mojave Desert. Krsanna Durant of TimeStar reveals startling new revelations that will shake the ufology universe. A Nevada road construction foreman at Mormon Mesa, Nevada, just outside a nuclear testing site, who encounters a female saucer pilot. Sporting a beret and looking quite the revolutionary, her name is Aura Rhanes and she is from the Venusian space base Clarion on the far side of the Moon. She’s monitoring atomic blasts in the desert. Possibly the second most powerful being from Venus posing as an aging, wannabe aspiring actress living in the North Hollywood Hills. An Aerojet missile contractor who flew in a remote-controlled flying saucer from White Sands, New Mexico, to New York City and back in less than 30 minutes, in 1949 no less. Never-before-seen photos taken by the contractor of Air Force personnel attached to him while working on the development of the top-secret Falcon missile’s dual radar and heat-seeking targeting systems are included. Countless others also appear in the well-documented pages of all Cosmic Ray’s epic Venus Rising books. So take your protein pills and put your helmet on because we are going to momentarily be blasting off for high adventures on Venus with both Cosmic Ray himself and his long-time friend and associate, the glorious Queen of Outer Space! The German “Rocket Man” who saved New York City in early 1945, the wife of a Japanese prime minister who traveled to Venus in another dimension aboard an ethereal beam ship, a California contactee under constant surveillance by the FBI’s Counterintelligence Program (COINTELPRO) and his public revelations that smashed the Venus Conspiracy. The enigmatic psychic Maria Orsic and the members of the Vril Social Club that inspired the early German science fiction writers and rocket scientists and countless others also appear in the well-documented pages of the Venus Rising series. So take your protein pills and put your helmet on because we are going to momentarily be blasting off for high adventures on Venus with both the Cosmic Ray himself and his long-time friend and associate, the glorious Queen of Outer Space! Dr. Keller’s book explores many facets of conditions and life on Venus in many dimensions from a perspective of conspiracies, history, theosophy, ufology and current events, especially space research. Dr. Keller has lived and worked in 43 different countries and has been writing about UFOs and paranormal activity since 1967. He was the founder and director of the Outer Space International Research and Investigations Society (OSIRIS) of Hilmar, California, as well as the publisher and co-editor of the New Millennial Star, a monthly pre-Internet tabloid newspaper. Raymond Andrew Keller, II, was born in Cleveland, Ohio and currently serves as an AmeriCorps VISTA (Volunteer in Service to America), attached to In Touch and Concerned, a United Way agency in Monongalia County, West Virginia, where he assists persons with disabilities, seniors and veterans in securing affordable transportation options. He also teaches various social studies classes as an adjunct professor at West Virginia Northern Community College in Wheeling, West Virginia. Keller has been involved in active UFO research since 1967, when he was a reporter for the Bedford Times Register in his hometown of Bedford, Ohio, and a research associate with Earl J. Neff, the founder and director of the Cleveland Ufology Project (CUP). Keller established his own group in 1986, the Outer Space International Research and Investigations Society (OSIRIS) and was the publisher and co-editor with Ballarion Starr of that organization’s monthly organ, The New Millennial Star. Keller has conducted numerous excursions to UFO hot spots throughout the world and has communicated directly with extraterrestrials on many occasions. Venus Rising is his second book; the first being Emergence of the Afro-Zulians in the Transatlantic World, 1722-1811 (Lewiston, NY: Mellen Press, 2013). He graduated from Bedford Senior High School in Bedford, Ohio and went on to honorably serve in both the United States Navy, where he was the feature editor of the Miramar Naval Air Station Jet Journal in San Diego, California; and in the United States Army, where he worked as a voice intercept operator in the Spanish language throughout Latin America. He received an associate degree in business from the University of Maryland and his bachelor of arts in world history from the University of Maryland, both degrees while on active duty. In 1989 he successfully completed the Multicultural Education Program at the College of Santa Fe in New Mexico, whence he went on to become the Director of English as a Second Language and Bilingual/Multicultural Education programs for secondary education at the Hilmar Unified School District in the San Joaquin Valley in California from 1990-1995. Keller was employed by VENUSA (Venezuela-United States Academy) in Mérida, Venezuela, in 2001 and 2002 as an ESL instructor and editor of the textbook division. He also was attached to La Universidad Valle del Momboy in Valera, Venezuela, from VENUSA. He returned to the United States in 2002 to accept a scholarship in foreign languages at West Virginia University, receiving his master’s degree in Spanish with an emphasis on Latin American literature in May 2004. He enrolled in the doctoral program in the Department of History in the fall of 2004, and mostly taught classes on Africana Studies, with some World History and Latin America.